Home to approximately 8,000 residents, the village of Hawthorn Woods, Illinois, is a wonderful community in the Ela and Fremont townships of beautiful Lake County. 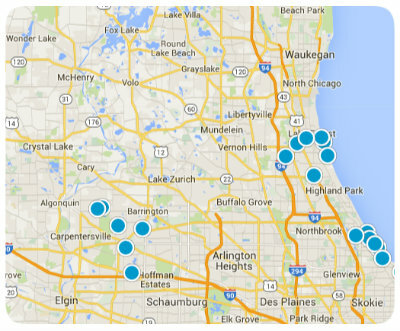 Hawthorn Woods boasts a great location just forty miles northwest of Downtown Chicago. Composed of around 7.9 square miles, the village enjoys easy access to major thoroughfares which make commuting and travel easy. Transportation arteries within the community include the Elgin, Joliet and Eastern Railway, Gilmer Road, Old McHenry Road and Midlothian Road. Formed in 1958, Hawthorn Woods is an upscale and friendly community providing an estate lifestyle that highly values the protection of the area’s natural resources. Hawthorn Woods has gorgeous open spaces and parks, top-notch schools, professional services and conveniently located business districts. The community is also home to the Hawthorn Woods Country Club, which features an Arnold Palmer designed course, and a state-of-the-art aquatic center. There are a number of leisure and recreation activities for residents to enjoy, including preschool programs, summer camp, recreation classes, a senior’s group and more. On Fridays throughout the summer the Village holds free concerts in the park. Other community events include several barn events, movies in the park, and other special celebrations like Fall Family Fun Fest, a tree lighting ceremony, 4th of July celebrations and more. Hawthorn Woods is a great place to call home in the Chicago metro area. This amazing community is not your typical suburb and has worked hard to preserve its rural ambiance while still providing all the modern amenities prospective homebuyers have come to expect. In addition to the great features listed above, Hawthorn Woods also boasts hundreds of acres of land dedicated to ten neighborhood and community parks. The parks have an abundance of recreation opportunities with playgrounds, softball and baseball fields, soccer fields, tennis courts, picnic facilities, gazebos, pavilions, inline skating rinks and concession stands. With all of these wonderful features, Hawthorn Woods is a must-consider destination when looking to relocate in the Chicago Metropolitan Area. Homes for sale in Hawthorn Woods include a few condos and townhomes and many single family homes. Condos and townhomes in Hawthorn Woods have an average listing price around $425,100 and generally top out around $530,000. Single family homes for sale in Hawthorn Woods have an average listing price around $597,200 and rarely cost more than $1.7 million. If you would like more information regarding homes for sale in Hawthorn Woods, Illinois, please allow us to assist you and contact us today.